Is Your Cover Good Enough? Aqua Pools Online > About > Blog > Is Your Cover Good Enough? Most people do a lot of research before they purchase a hot tub. They want to make sure that they are getting a quality product with the best features. When it comes to replacing their hot tub cover, many of those same people don’t do much research, if any, because they are under the impression that ‘any old cover will do.’ That couldn’t be further from the truth. The right cover plays an important role in how efficient and protected your hot tub is. Below you will find a guide to help you determine when you need to replace your cover and what you should look for when you are purchasing a new one. Most hot tub owners will find that they need to replace their cover every 3-5 years if you live in northern climates. Those in southern climates may be able to stretch it a few more years, but 3-5 is a good rule of thumb. As a hot tub owner you should regularly be looking over your cover for visual signs of wear, such as holes, tears, mold build-up or breaking down of the vinyl from imbalanced chemicals. Many of these things can be repaired, if they are caught early, to extend the life of your cover. However, a combination of these things, or a cover that has already had several repairs should definitely be replaced. A heavy, waterlogged cover is also a sure sign that your cover needs to be replaced. The foam core inside of the cover should stay light and dry, if it is taking two people to remove your hot tub cover, it is time to start looking for a replacement. Your hot tub cover is your main line of defense to keep weather and debris out of your hot tub. You will want to make sure that you purchase a cover that is made of a high quality marine grade vinyl. Quality vinyl will help ensure that you get the fullest life possible out of your cover because it will stand up to the elements. This is especially important in northern areas where your cover could spend a fair amount of time covered in snow. You will also want to make sure that it is a nice thick cover. The thickness has more to do with keeping heat in than it does with keeping things out, but is still equally important. The whole idea of a hot tub is that it stays…hot. A thick cover will help keep the water warm and the cold out. This will save on your energy bill as well. A 4-6 inch thick cover is recommended for all hot tubs. If you live in a snowy climate the 6 inch will be much better for supporting the heavy weight of snow accumulation. Much of the heat that is lost through the cover is lost through the seams. It is important to purchase a cover that has fully insulated seams to keep heat loss to a minimum. A cover that has blown off due to a strong wind is useless. Locking straps will make sure that your cover stays tightly in place so no debris can enter the tub. More importantly, locking straps keep children safely out of the hot tub and prevent animals from getting in as well. So, purchasing a cover with locking straps is a must for your hot tub. 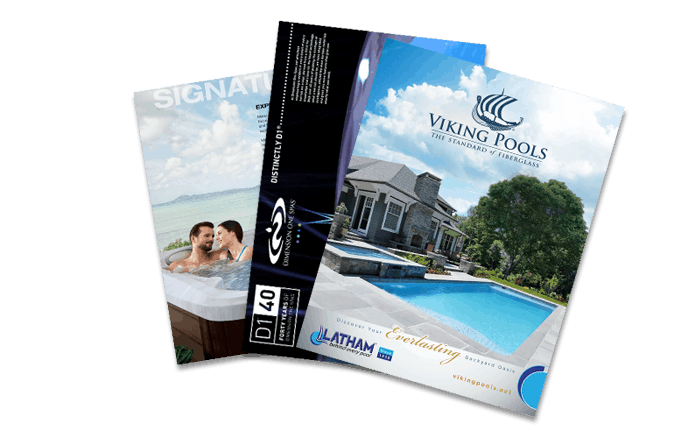 Finally, you want to make sure that you purchase a cover that fits properly for your particular make and model of hot tub. Now that you know when to replace your cover and what to look for in a new cover, you will be fully prepared to choose a hot tub cover that enhances your investment. If you still have questions or if you are ready to purchase a replacement cover stop by our Aqua Pools’ showroom and let our staff help you pick the perfect cover.